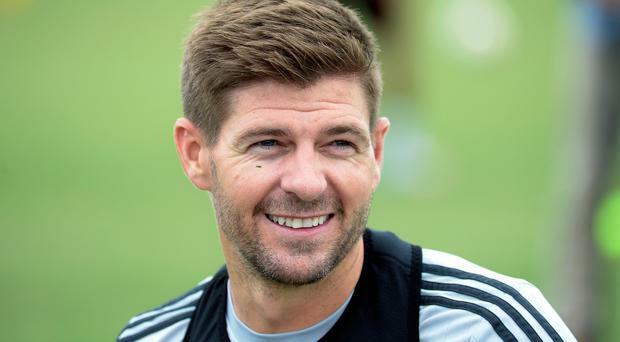 Steven Gerrard will today be unveiled as the new Rangers manager in a three-year deal. The Liverpool legend has agreed to replace Graeme Murty as boss after seeking reassurances over transfer funds from the board. Gerrard flew to London for talks with the Ibrox hierarchy and he has agreed to help revive the Glasgow club's fortunes. The 37-year-old returned from Rome at lunchtime yesterday to head into a final round of negotiations after working as a pundit at the Stadio Olimpico where his old club booked a place in this season's Champions League final. Gerrard's representatives had been in discussions with Rangers managing director Stewart Robertson and director of football Mark Allen. He had been seeking assurances on the size and scale of his transfer budget and it's believed his decision has been based upon the promise of fresh investment. Rangers chairman Dave King has offered guarantees of the sums available to mount a credible challenge to Celtic and Gerrard has intimated he's up for the challenge. WMeanwhile, Hibernian boss Neil Lennon has launched a scathing attack on the Gers for their "scandalous" treatment of their former boss. Ulsterman Lennon, who played and managed at Celtic, has sympathy for Gers' former academy boss. The former Northern Ireland international said: "It's scandalous the way he's been treated. That's just my opinion but he's been hung out on his own. "I've been in that sort of position myself at Bolton when there is no leadership or structure." Murty had to deal with a statement from chairman Dave King which cast doubt on his position - as well as speculation over the possible appointment of Gerrard - all the while trying to prepare his team for two showdowns with Brendan Rodgers' all-conquering Hoops. Lennon revealed he even called Murty this week to offer his support and best wishes for the future. But he also took aim at Gers chiefs over their failure to give the former Reading defender more backing. Lennon added: "There is a structure at Rangers but there seems to be a lack of real genuine support. "When it really got tough a lot of people turned their back on him, which I found unpalatable. I've spoke to him this week to offer my support. "At the end of the day Graeme is a human being. People forget that. It was a very difficult position he was put in and even an experienced guy would find that situation very difficult. "So I just rang him for a few words of encouragement and to wish him well in whatever he decides to do." The Lurgan native went on to add that he believes guiding Hibernian to second spot in the Ladbrokes Premiership would taste just as sweet as any of his title triumphs at Celtic. The Easter Road boss won three straight championships during his Parkhead reign. But he says taking his Leith side to the runners-up spot at the end of their first campaign back in the top flight would rank just as high as any of those Hoops triumphs. With three games remaining, Hibs sit three points behind tomorrow's opponents Aberdeen and level on points with Rangers as the three clubs eye the finish line in the sprint to end the season behind Ulsterman Rodgers' champions. "It will be as good as winning the title," said Lennon ahead of this weekend's Pittodrie trip. "We can't win the title unless we get resources that are close to Celtic's. We understand that. "But can we finish best of the rest and is that exciting for our fans? Yeah it is. "Is it exciting for me and the players? Yes. "That's because this is our first season back and they have performed unbelievably well. "I'm not bothered about (those who looked down on the race for second). You know me, I like to win. "There has to be a realism about it and if we can finish second it would be an incredible achievement for a team who have just been promoted." Only goal difference is keeping the Gers in front of Lennon's team but the Ibrox men will have to dig deep if they are to respond against Kilmarnock after suffering yet another humiliating pasting from Celtic in last Sunday's Old Firm showdown. Lennon does not believe he can yet count the shattered Rangers squad out of the second-spot fight. He said: "Absolutely not - you can't write Rangers out of it. They are still capable of winning games. "However, psychologically they have been damaged heavily. "It's been a tumultuous week for them. That's their issues and they still have to deal with them the way they see fit. "But I'm certainly not writing them out of the race for second place."